Census-GIS is a GIS for analysis and visualization of Census Data. 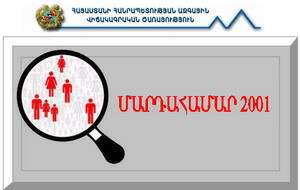 Census-GIS was developed in 2002 for assessment and mapping of census conducted in Armenia one year before. GIS allows complex queries from the raw database of census compiled at Statistical Service of Armenia. Census-GIS is based on ArcView 3.x environment and is customized using Avenue programming language. GIS queries the raw database and links dynamic data with the digital layers creating thematic maps based on different attributes.